Netflix is hitting the road this summer with a fun series of modern classics, including `Jaws,' `Ferris Bueller,' `Clerks' and `Escape from Alcatraz.' The hook is that each movie will be shown where it was filmed -- so you can watch `Field of Dreams' in the field in Iowa where it was shot, or see `The Shining' at the Stanley Hotel in Colorado where Jack went bonkers. Hosting the series is the folk-pop cutie Lisa Loeb. Admission is free, and audiences are encouraged to bring their own folding chairs or blankets. A few screenings, like `Poseidon Adventure' at the Queen Mary in Long Beach or `Escape' on Alcatraz Island (which I'm hoping to go to), require tickets. - Merissa Marr of the Wall Street Journal (them again - subscription required) has a great report on the challenges for filming two sequels to `Pirates of the Caribbean' back-to-back. The pair of movies were originally budgeted at $350 million, but now the tab's expected to hit at least $450 million. Marr notes that the Disney division that's releasing `Pirates,' Touchstone Pictures, "is being cut back to just a couple movies a year from six or seven." Studios make fewer movies...with larger budgets...based on known properties (comic books, best-sellers, TV shows, earlier movies, theme park rides.) Because they're making fewer movies, and spending so much on them, they can't take many risks. The likelihood of a movie like `Pirates 3' containing a surprise is roughly equivalent to the likelihood of GWB admitting a mistake. But at the same time, cheaper filmmaking tools, viral marketing, and new distribution outlets like the Internet are making it easier to make a movie for under $1 million. (My favorite example, `Napoleon Dynamite,' was made for about $400,000.) They're also improving the odds that a low-budget project can be a break-out hit -- or at least recoup its money. Does one dynamic necessarily cancel out the other? Will we see the studios lumber into a tar pit and die? I don't think so. In the world of cheese, Kraft sure sells a lot of flavorless Velveeta, while Cowgirl Creamery simultaneously does well selling its tasty artisanal cheese made from organic milk. - Docurama is trying to replicate the film festival experience at home, according to this piece from the LA Times. What they're really doing is packaging a set of 10 films (for sale, not rental), and offering online forums on their Web site where you can discuss them. This would work better if they had `big names' putting together the festivals... Ken Burns on documentaries, Mike Nichols on comedies. (I don't see it taking off as it's currently structured.) Netflix would have much better luck allowing its users -- or enlisting big names -- to build film festival lists of movies that people could rent, rather than buy, I think. The thing that seems really difficult to duplicate, though, is the fun discussions about movies that you have while waiting on line for a movie at SXSW, or riding the shuttle bus at Sundance. "I had the luxury to go back and tailor the film exactly like the fans demand and they expect," said Ellis, whose experience with "Snakes on a Plane" reflects the increasing influence that Internet fan communities have over what's playing on multiplex screens. It's as if thousands of people worldwide are sitting in on daily rushes, in which the crew and studio executives offer advice and commentary on movies during production. Although most common with films based on superheroes such as Superman and fantasy worlds such as in "The Lord of the Rings" — franchises with established rabid fan bases — the Internet's reach is gradually turning the already collaborative process of moviemaking into a global endeavor. That last statement might be a bit over-reaching today...but I do think it'll eventually prove true. In his new role, Mr. Reid will work with National CineMedia's management and NCM founding partners, as well as various financing sources and the major motion picture studios on the development of a digital cinema business plan and financing model. Reid will also work closely with Tom Galley, NCM's chief operations and technology officer, who is responsible for digital cinema system design, procurement and implementation. Once a digital cinema business plan is finalized, Reid, in cooperation with funding sources and the studios, will guide the development of a financing structure to support the deployment of digital cinema equipment for NCM's partners'13,000 screens, as well as other participating exhibitor screens. In addition to "Superman Returns," Imax and Warner Bros. will be releasing two other computer-animated films in 3-D this year: "The Ant Bully" in August and "Happy Feet" in November. In September, Sony Corp.'s Sony Pictures unit will release its animation division's first computer-animated film, "Open Season," in Imax 3D. ...However, there are also 3-D films on the way outside of Imax, thanks to the expanding number of digital 3-D projection systems in conventional theaters. Sony is releasing "Monster House" in July, and Walt Disney Co. is planning to re-release "The Nightmare Before Christmas" in Disney Digital 3D in October, as well as its newest computer-animated film, "Meet the Robinsons," in March 2007. Whenever I link to the Wall Street Journal, I get complaints from those of you who don't shell out the $$$ for a subscription. So apologies in advance. But YouTube is the subject of a front-page piece in today's paper. I bumped into YouTube co-founder Chad Hurley in a green room at the L.A. Film Festival last Friday. We'd been talking a lot on my panel about how some YouTube clips have attracted a giant audience -- in particular, we cited `Evolution of Dance' as an example. It has been seen more than 25 million times. So I asked Chad whether video producers whose videos become popular might at some point switch on the cash register. Why couldn't the creator of `Evolution of Dance' decide that, after 10 million views, he would start charging 25 cents per download? Hurely looked at me like I'd just fallen off the turnip truck. YouTube is a community, he said. It's about sharing video, not cranking up cash registers. But it does sound, from the Journal piece, that YouTube is in the midst of launching a way to sell advertising around videos -- and that it will split the revenues with video creators. We'll see if that approach works better than Google's more commerce-oriented strategy -- which is more like setting up a cash register. Kevin J. Delaney of the Journal reports that YouTube users are uploading 60,000 clips a day. A graph that accompanies the Journal article indicates that YouTube has now shot past MSN Video in popularity, with about twice as many visitors. Delaney writes that the "entertainment world [has begun] exploring how it might benefit from YouTube's audience." The Weinstein Co., a movie company run by producers Bob and Harvey Weinstein, in April premiered the first eight minutes of the film "Lucky Number Slevin" on YouTube. Viacom Inc.'s Paramount Vantage movie unit last Friday posted exclusively on YouTube an 83-second animated clip poking fun at Al Gore to promote its "An Inconvenient Truth" film. By midday yesterday, it had been viewed nearly 600,000 times. "As a marketer you almost can't find a better place than YouTube to promote your movie," says Andrew Lin, vice president for interactive marketing at Paramount Vantage. Viacom owns YouTube rival ifilm. "Superman Returns" opens June 28 in standard-screen theaters — but there's a version with 20 minutes of 3-D footage that will open in more than 115 Imax theaters, making it by far the widest release in the history of those king-sized screens. It will also become the first Hollywood film to be shown at the Smithsonian Institution's Imax theater in Washington. ...[H]ow will viewers know when the 3-D scenes are on? An Imax official said there would be a visual alert flashed on screen (such as a pair of green glasses in the corner) but [director Bryan] Singer said there's a more intuitive cue. "Pretty much when Clark Kent takes his glasses off," Singer said, "you put yours on." - Most reviews of `SR' (including this pan from Roger Ebert) don't make any mention of the Genesis digital camera that was used to shoot the movie. That's a good thing, I think, indicating that the movie (which I haven't seen) doesn't scream `digital.' The same was true of last week's `Click,' which was made with the same camera -- none of the reviews remarked on the digital angle. I could only find two reviews of `SR' that made mention of the Genesis, one from Movies Online, and one from the San Jose Mercury News. Cinematographer Newton Thomas Sigel used wide lenses and large framing to convey the enormous size and scope of the film. “Superman Returns” is the first feature length motion picture to be shot entirely with a Genesis digital camera system, jointly invented by Sony and Panavision, which emulates the curve and color space of film. The filmmakers paid meticulous attention to detail to the physical shooting of Routh as well as the computer rendering, scanning and animation of the character in order to capture the reality of a man who can fly at will. The end result is an extraordinarily gorgeous looking film filled with breathtaking imagery that makes you believe a man truly can fly. The movie was photographed using the latest-generation digital video camera, and the results are eye-poppingly realistic. 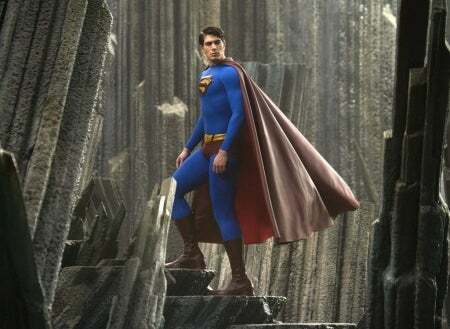 When Superman (played by Brandon Routh) makes his entrance -- attempting to rescue a jumbo jet that's hurtling toward the ground in a flaming flat-spin -- the picture's huge frame and forced perspective give his struggle a real size and weight. Both Roberts and Newman really liked the movie. Here's a compilation of critical opinion from RottenTomatoes.com. Finally, Here's a CinemaTech entry from last week that includes some comments from `SR' cinematographer Newton Thomas Sigel. The number of visitors [to GUBA] is far behind sites like MSN Video, with more than 16 million unique visitors, or YouTube.com, with more than 13 million, according to research firm comScore Networks Inc. Mr. McInerney believes even those who have illegally downloaded movies and shows in the past would be willing to pay for them on Guba. Many users already are used to paying Guba for certain search subscriptions. New movies will cost $19.99 on Guba, and older titles will cost $9.99. New titles can be rented for $2.99. Movies will be available to buy the same day they come out on DVD, while rentals will be available a few weeks later. Virginia Heffernan, a TV critic at the NY Times, launched a blog last week called `Screens,' focusing on Web video. ...[W]ith everyone creating and producing and uploading now, who is going to be on the downside, watching and savoring it all? All of that web video, viral video, user-driven video, custom interactive video, consumer-generated video, embedded video ads, web-based VOD, broadband television, diavlogs, vcasts, vlogs, video podcasts, mobisodes, webisodes and mashups? Um, me? Yes, that’s my idea. I’ll watch. That’s what Screens is for. Sounds good, and this will be a blog to watch (only one entry so far). But Heffernan betrays that she's a newbie to the world of online video when she mentions she has not heretofore heard of zefrank, who made the wonderful predecessor to Judson Laipply's Evolution of Dance. Google said it is testing a program that allows advertisers to bid on individual "premium" videos to run a 15- to 30-second ad at the end of these clips. Users can watch this select content gratis via a prominently displayed "Free Today" section on the site's home page. In addition, participating advertisers are able to run a persistent icon and text link above the video screen as these clips are played—of the "this video was made possible by" variety. As of June 23, a handful of big-name advertisers had signed on to participate in the test. Hewlett-Packard was sponsoring nearly hour-long interviews from The Charlie Rose Show, and Burger King was sponsoring seven-minute clips from the 1960s cartoon Felix the Cat. In addition, LowerMyBills.com was sponsoring a instructional video on installing a shower pan liner from AsktheBuilder.com. - MIT prof Henry Jenkins, who focuses on fan culture, has an entry on his new blog examining the `Snakes on a Plane' phenomenon. "In this case, you had a production company which was monitoring the fan response and like a real leader, figured out where the crowd was going and ran out in front, shouting follow me," he writes. I hopped back and forth between two events today in L.A.: the L.A. Film Festival’s tech day at UCLA, dubbed “The Revolution Will Be Digitized,” and CineGear Expo, just on the other side of the 405. Distribution consultant Peter Broderick opened “Revolution” by sharing some success stories about indie filmmakers who’ve taken control of their own marketing and distribution. Most of the examples he cited, including the wrestling movie “Reversal,” involved not digital delivery, but selling tens of thousands of DVDs online, by targeting special interest groups (like high school and college wrestling clubs). Peter said the director had earned more than $1 million (not sure if that’s net or gross). Peter’s view of the future for indie filmmakers is what he calls “hybrid distribution” – a mix of traditional methods, like theatrical release and sale of DVD rights, and doing some experiments with new channels. I arrived at CineGear in time to see a panel on cinematography, led by journalist Bob Fisher and cinematographer George Spiro Dibie. It includes cinematographers Owen Roizman, Isidore Mankofsky, Russell Carpenter, M. David Mullen, Jerzy Zielinski, Laszlo Kovacs, and Rodrigo Prieto. Carpenter also talked about the importance of directors who can lay out their vision during pre-production – and directors who have real passion about this particular project. (He shot "Titanic" and "True Lies" with James Cameron, as well as "Charlie's Angels" and "Shallow Hal." They listed some favorite cinematographers, whose work had inspired them, including: Greg Toland, Charlie Lang, Jimmy Wong Howe, Harry Stradling, Sr., Arthur Miller, Conrad Hall, Vittorio Storaro, and Haskell Wexler. Afterward, I checked out these booths: Kodak, Fuji, Dalsa, ARRI, Panavision, and Red. Dalsa was showing its gigantic Origin 4K camera, which reps said wasn’t as heavy as it looks. (You can hand-hold it, or use a shoulder mount.) Dalsa was projecting some Origin imagery inside a tent, and it looked extra crispy. Red is still showing models of what its camera may look like. A rep there said that by the IBC show in Europe this September, they expect to be showing images from the camera, and later in the year, the camera itself. Their goal is to start shipping by Q1 of 2007. ARRI said that its D-20 digital camera is now available for rental in L.A. -- a new development. Interestingly, they’ve introduced both a new digital camera this year (the D-20) and a new 16-millimeter camera (the 416). Companies like ARRI feel the world isn’t about to ditch film cameras overnight. At a panel put on by Panavision about digital cinematography, sales VP Bob Harvey was asked by an audience member whether the company had stopped making film cameras. Harvey denied it, but suggested that the assembly lined had slowed: “We’re not building 100 this year." And the company maintains a pretty big inventory of film cameras for rental. "We have 1000 film cameras [in our warehouse today],” Harvey said. After grabbing an In-and-Out Burger for lunch, I went back to UCLA to see Peter run a panel of three filmmakers, "Reversal's" Jimi Petulla, Jeff Santo, and Brian Terwilliger, who’ve been pioneers of D.I.Y. marketing and distribution. Jeff said that when he first opened his Web site to sell “This Old Cub,” he got 1500 orders in the first 12 hours; they paid back the investors in four months. I’m eager to see “One Six Right,” Brian’s documentary about the Van Nuys Airport. Brian said it’ll be the first indie film available on HD-DVD, later this year.) He's also done a deal with Sony to have the movie shown in a dozen Landmark Theatres that are equipped with Sony's 4K digital projector, he told me after the panel. Sources familiar with the talks say Hollywood executives are frustrated with [Apple CEO Steve] Jobs, who is personally doing most of the negotiating for Apple. "It's all his thing, and he is the one making it happen at this point," says one source. Some Hollywood insiders are uncomfortable haggling with Jobs, who is a director and the largest shareholder of a huge rival, Walt Disney & Co (DIS). Another reason a deal may not be imminent is that neither side needs it to happen right away. Music studio sales were collapsing at the time they negotiated deals with Apple. Not so with Hollywood studios, which can continue to work on other deals with the security of knowing that Apple might not be able to sell a lot of movies on their behalf anyway. I think I've mentioned here before that I'm moderating what promises to be a great panel this Friday morning at the LA Film Festival, but I haven't posted the panelists before, since they've only recently been confirmed. With the advent of Internet TV (IPTV), the web promises global access to content and interactivity. Is it democratization of the media, the dawn of a digital community, or the end of the theatrical communal experience? These questions demand an exploration of the ways in which film distribution, community, and the artistry of film are being redefined. - Not surprisingly, price is a sticking point in the talks between Apple and movie studios over offering movies on iTunes. Steve Jobs seems to be lobbying for one flat price - $9.99 - for movies, while the studios would like to sell movies for a range of prices, some of them perhaps twice as high as that. One other issue: the studios may not want iTunes pricing to undercut prices for physical DVDs at Wal-Mart, their biggest retail outlet. Here's what I expect to happen: at least two prices on iTunes, one for new releases (say, movies released on DVD within the last 60 or 90 days) and another for older library titles. - Netflix says it is still considering how it might deliver movies via the Net...perhaps using a set-top box. (Just like TiVo, Akimbo, Moviebeam, etc. etc.) I think that Netflix's consumers think of it primarily as a subscription service, and that trying to market a set-top box would be a disaster for the company. About 43.9 million U.S. households have the broadband Internet connections necessary to watch online video, according to Jupiter Research. But in a March survey, Jupiter found that only about 57% of adults with broadband watched online video regularly, and nearly all of that viewership was on a PC. - The Journal also has this interview with Bill Gates in which he explains why his company can't do innovative stuff like YouTube. ...[U]p until recently, even though you would shoot it on film, you would still make film dailies, and transfer the film dailies to the computer. Now, "RV" was the first movie where we didn't even do that. We just shot the film, took the negative and immediately transferred the negative to a hard drive. And the first time I saw a print of "RV," or even dailies shot on film, was when we finished the entire movie. I still don't love the way [movies shot digitally] look. I still think they look a little too immediate. One of the things about film -- if you originate on film -- is it still has a certain grain to it that the mind is used to having. Video still looks a little bit like reportage. It still feels a little bit like you're watching the six o'clock news. Now that's changing very quickly, and now we're going to get to digital projection, which is going to be the biggest change for moviegoers. In the next five years, every theater in America or most theaters in America, maybe five or six years, will have digital projectors. You will no longer be seeing a movie projected on film. One assertion in this LA Times piece about YouTub really jumped out at me: "Major TV studios have also started trolling YouTube and similar destinations for the next generation of acting and directing talent." In the process, the Web is offering the kind of instant connection to Hollywood that countless denizens of public-access talk shows have craved and seldom received. For example, Twentieth Century Fox Television, producer of "The Simpsons" and "24," has junior executives scouring the video-sharing sites. "We also have a casting executive assigned to discovering new talent, and these sites can be particularly fertile ground," Jane Francis, senior vice president of Fox's boutique programming arm Fox 21, said in a statement. "While these efforts have not yet resulted in a major piece of casting or story idea or project, we believe it is only a matter of time." In fact, the networks may need YouTube more than YouTube needs them. The most-watched video on the site is "Evolution of Dance," in which motivational speaker Judson Laipply spends six thoroughly silly minutes grooving onstage to song samples like "Kung Fu Fighting" and "What Is Love." Since April 6, the clip has been watched more than 24 million times — a viewership figure far larger than any current network sitcom can boast. It doesn't mean prime time will soon be filled with faux music videos by a teenager who borrowed his dad's digital camera. As [Carson] Daly put it, "I don't think you'll see a 30-minute sitcom made from someone's bedroom." But at the very least, Hollywood's gate-keeping practices might change: Schwabs' Drugstore may have been reinvented, electronically. Jim Puzzanghera and Mark Magnier of the LA Times had a good piece yesterday on piracy in China -- and how the movie business is trying to develop that country as a market. Surprisingly, they say that today, the movie industry only earns in China about $67 million a year -- about what it earns in Switzerland. On Friday, in front of the Beijing Friendship Store a few blocks from the U.S. Embassy, a man carrying a black shoulder bag was working the street. The 35-year-old man, who would identify himself only by his family name, Li, said he had been doing this for six years. Even though "The Da Vinci Code" is no longer in theaters [in China], the man said, he sells five or six bootleg versions a day, making it his top seller. His DVDs generally go for the equivalent of 70 cents to $1.10, depending on how aggressively customers bargain. He said he earned about $120 a month. "If the police come, I can run away quickly," he said. "But it's all right now. The cops are all on lunch break." China had the highest piracy rate of any country in 2005, with 90% of potential revenue lost to copyright-violating DVDs, according to a study by the Motion Picture Assn. of America. Although "The Da Vinci Code" was pulled from theaters, DVD versions remain widely available on the streets of Beijing and Shanghai. Along with costing Hollywood money — an estimated $244 million last year — the availability of cheap DVDs reduces pressure on the government to allow in more foreign films. A piece I wrote ran this past Tuesday in the Hollywood Reporter, noting that three big summer releases (`Click,' `Superman Returns,' and `Miami Vice') were shot with digital cameras. I wanted to share a few extra snippets of info from my interviews with the cinematographers involved in making that trio of digital movies. Digital cinematography, during its formative years, had much in common with kryptonite: It was mysterious and dangerous, as far as most mainstream directors and cinematographers were concerned. And digital cameras, like the Superman-sapping rock, might as well have come from outer space because many early prototypes were developed for television, not feature films. But after an early wave of big-budget movies shot digitally -- including 2002's "Star Wars: Episode II -- Attack of the Clones," directed by George Lucas; 2003's "Once Upon a Time in Mexico," helmed by Robert Rodriguez, and 2004's "Collateral," from director Michael Mann -- were dismissed as interesting experiments conducted by directors eager to tinker with the newest camera gear, this summer is bringing another trio of high-profile studio releases made without film. Their arrival could make digital cinematography more difficult to brush off. "If I was starting another movie today, I’d probably be more likely to shoot the Genesis than shoot film. Since this is the direction it's going, I’d like to work on making digital image capture the best it can be. For future projects, I’d ask, `Is there any reason to shoot this on film? But I’m not quite sure what the reason would be." Dean Semler told me that Mel Gibson was the one who initially suggested to him the idea of shooting `Apocalypto' digitally. "Mel is really curious about new technology," Semler said. "As a producer, he's very much aware of the costs." Semler wound up shooting the Adam Sandler movie `Click' before `Apocalypto,' also using the Genesis. He told me that each high-def tape they used was "roughly $7000 cheaper than shooting [the same amount of footage] on film." Semler also said that before he shot `Stealth,' he'd looked at the Sony F900 and F950 (two earlier generations of digital cameras), but found the dynamic range lacking. Semler said they battle-tested the Genesis on the set of `Apocalypto' in Mexico. "We had a Spydercam shot from the top of 150-foot waterfall, looking over an actor's shoulder and then plunging over the edge –- literally in the waterfall. I thought we’d be doing it on film, but we put the Genesis up there in a light-weight water housing. The temperatures were beyond 100 degrees at top, and about 60 degrees at the bottom, with the water and the mist. We shot two fifty-minute tapes without any problems – though we [did get] water in there once and fogged up." Semler said, "I love film, and I'll probably shoot film again -- but this has really been a revelation to me." Dion Beebe, who just won the Best Cinematography Oscar this year for `Memoirs of a Geisha,' shot much of `Collateral' digitally, and even more of `Miami Vice.' He said that shooting digitally "is not a no-turn-back situation for me. For me, it's really about which format best suits the project and the story -- and [high-definition] brings another tool to the filmmaker. That's really how I see it. Of course, the introduction of HD has produced some great new film stocks from Kodak in response. It has sort of pushed them." Beebe isn't wild about the umbilical cables that connect digital cameras to tapedecks, and the ability to keep rolling for nearly an hour before the tape runs out. "Me, I like stopping and reloading so you can make adjustments." He added that digital cameras "change some of the dynamics on the set...Cameras tend to roll a little more freely in HD, and you're so used to that `roll cameras and sound and slate' model. You're also so much more reliant on the monitor. You light through the monitor, and set your aperture through the monitor. I find I'm hardly using my [light] meter at all." For `Vice,' he used a mix of the Viper FilmStream camera from Thomson and the Sony F900 and F950. "We'd use the 900s and 950s when we needed an on-board record system, for get-up-and-go -- in the passenger seat of a Ferrari, or in a small boat or airplane. We occasionally shot on film...only when we required ramping or off-speed work." So what does it mean that Industrial Light & Magic is on the verge of selling off its model shop to Mark Anderson, a long-time employee? I don't think it means that we're seeing the end of models and miniatures in feature films -- at least not quite yet. There are still plenty of instances where it is cheaper to create an object out of wood and glue than of microprocessor power and pixels. I simply think that the model shop isn't a real profit center of ILM anymore -- the workload tends to be "burst-y" rather than consistent -- and that from ILM's perspective, it makes more sense to spin this group out, and continue using them as contractors. They're going to call the new company Kerner Optical -- a reference to old-school optical (rather than digital) effects. Unit ... will focus on all physical production, including models, miniatures and stage work. Once spun off, Kerner Optical will aim to pick up the slack by seeking work that ILM would not get. Kerner will become a preferred subcontractor for ILM. ILM's physical production unit never made the move to Lucasfilm's new HQ at the Letterman Digital Arts Center in San Francisco's Presidio. It'll be interesting to see how well the model shop that helped launch the `Star Wars' and `Indiana Jones' franchises -- and won so many Visual Effects Oscars -- does as an independent entity. The biggest challenge will be bidding against `Young Turk' digital effects studios that are eager to land movie projects (and willing to lose money on the first few). Kerner will need to be phenomenally efficient...and have a great rainmaker on their side. While sites like YouTube and Veoh have lately become popular for allowing users to share their self-produced videos, Jumpcut is part of a new class of sites that also offer simple tools for stringing together video clips and then adding soundtracks, titles, transitions and unusual visual effects. All of the sites...have been introduced within the last year. This summer, they will be joined by another site, Motionbox, based in New York. Their shared objective, the founders of the sites say, is to reduce the complexity of video editing and to reduce the cost to zero. "We wanted to make video editing over the Internet faster than desktop editing," said Jim Kaskade, co-founder and chief executive of Eyespot, based in San Diego. "We think it will broaden the base of people who are creative, but may not have thought they were, by creating this tool kit for them. Editing video is eventually going to be as simple as sending e-mail." Jumpcut seems much slicker as an editor, probably because it's based on Flash, but screen redraws were quite buggy in Firefox Mac and you sometimes saw a blank screen or a screen with lots of stuff missing. Eyespot didn't seem as buggy, but you have to open every clip in it's own window and thus seemed much more awkward to use. My feeling is that one of these, or something like them, will probably catch on at least in a limited way. For me, the lack of responsiveness is a real problem, but with faster connections it will eventually improve. What makes it appealing is that it gets rid of the problem of storage, and for that reason it seems very freeing. Let somebody else worry about where all this stuff is and how to back it up! But how much storage can they be offering? It's hard to believe that it would be enough. I can't really imagine uploading hours of DV material. Too slow, and the quality I saw sure wasn't DV. So for now it's for videos made with still cameras or phones or grabbed from YouTube. The ramifications are good and bad for us professionals. It raises awareness of what we do, which is important, but it also attracts people to the field, which increases competition. In both these ways it's no different than FCP or iMovie. Just a step further in the democratization of motion media. There will probably be stylistic ramifications, too. In the same way that music videos and home videos influenced the style of films, probably these ubiquitous internet videos are going to change our tastes. Already I find a lot of network video seems dull, canned and lacking in originality and spontaneity, probably because most of the stuff I watch is homemade and available on the net. I guess, bottom line, online editing seems inevitable. But as a tool, not all that flexible or powerful. Sony Electronics showed off a brighter version of its 4K digital cinema projector yesterday at the Digital Cinema Lab in Hollywood. The one I saw last fall was 10,000 lumens, and this one is 18,000 lumens, capable of lighting up a 52-foot screen. ...Panelists explored benefits and issues of producing "The Da Vinci Code" digitally in a question and answer session following the screening. Movie goers will see more movies distributed in the latest technology from Sony Pictures. In fact, Al Barton, vice president of digital cinema technology at Sony Pictures Entertainment, said the studio will release the majority of movies in digital 4K by January 2008. "We get better prints and imagery," he said. "Sony wants to pull archives off the digital intermediate, which has become the master, unless you're going to go back and redo the entire film." Will digital cinema revive movie classics? Two entrepreneurs in Glasgow, Scotland are gonna give it a shot. One Scottish cinema chain, Cineworld, already reports that a "classics night" featuring `Top Gun' recently outgrossed new releases. Analysts predict audiences will rocket as more venues equip themselves with new digital equipment and start showing a wider variety of old classics. Leading the trend are two Glasgow entrepreneurs, John Letham, a former electronics marketing executive, and Nick Varley, who used to run the city's Grosvenor cinema. They have acquired theatrical rights to more than 6,000 old movies, including the James Bond and Carry On series. Next month, they are re-releasing the Martin Scorsese classic Taxi Driver, starring Robert De Niro, and in August Oklahoma! gets an outing. Letham says the arrival of digital cinema - which replaces huge, fragile reels of film with dirt-cheap discs - has made it economically possible to return classic movies to the big screen. Taxi Driver will be a traditional film print costing anything from £2,000-£7,000, while many copies of Oklahoma! will be £50 digital copies. Massachusetts filmmaker Greg Joyce e-mailed last month to let me know he was experimenting with Brightcove, a relatively new platform for distributing and selling video on the Net. He's chopping up his comedy `Working Stiff' into three and four-minute chunks, and using Brightcove to make it available as a kind of Web serial -- for free. I actually really like your ‘episodic’ or ‘webisodic’ approach to your film. One of the things that make broadcast television series so rich is that they develop over time and the viewers can develop a much deeper relationship with the story. Unlike broadcast and cable, however, Internet TV gives the producer the option of delivering these at any time and length. This makes things potentially more cost effective to start building an audience. The threshold for a TV pilot is several hundred K, for a series, many many millions. But the cost threshold for an Internet TV show is much much lower, and the producer can engage with their audience in a more direct fashion and adapt the storytelling and characters based on audience engagement. We think that casual broadband consumers will want to consume a lot of content daily in 2-7 minute bursts of high-quality, streamed viewing. But once they develop either a specialized interest in a content or topic, or a deeper loyalty to an entertainment product, they’d be willing to pay a small fee (.99 cents) to download a DVD quality version of the feature-length show, and be able to use it easily on a TV or portable device. I applaud Joyce's experimentation, but I feel like feature films are written and directed to be viewed in one or two (or maybe even three) sittings. A half-hour TV show is structured in a way that it's most enjoyable consumed in a single gulp. I just don't think that putting long form content through the Cuisinart and serving it up as Internet video is gonna work. I do think that `mobisodes' and short Web films are perfect filler for those procrasinatory moments we all encounter during the day, and watching a few of them on iFilm or YouTube can be really fun. And I'm sure you could create a great 100-part (or infinite) serialized story, with two or three minute episodes. But do you really want to consume `Blazing Saddles' or `Schindler's List,' one teaspoon at a time? The thing that's really gonna hurt traditional TV (broadcast and cable) is when there's a relatively easy way to get Internet video delivered to a set-top box, like a TiVo. My vision is that any video you encounter on the Web would have a "Deliver this to your TV" link next to it, much the same way many newspaper articles have a "E-mail this article" feature. I also think there will be ways to subscribe to video feeds -- a la blogs and RSS -- that will constantly deliver new content to this TV queue for viewing, and also personalization software that follows your preferences and sends video on topics you care about, or by creators you like. (Of course, when you're viewing this stuff on your TV, you'll want to rate it based on how much you enjoyed it, so the software can get smarter.) What happens to traditional channels when they're competing with an evening line-up -- the queue -- that you've designed yourself (with a little help from your personalization software)? For TiVo's broadband video content partners, the agreement delivers access to more than 400,000 TiVo subscribers and enables consumers to easily access the content directly from their television sets in their homes. TiVo will give these outlets a platform to reach their consumers and enthusiasts in a direct and effective way, providing them a vital opportunity to be profitable through distribution, introduction of advertising, subscription plans, or pay- per-view. Here's the WSJ coverage, if you're a subscriber. Star magazine chief editorial director Bonnie Fuller, for example, will suggest shows about pop culture. Other program pickers will come from Vanity Fair, Sports Illustrated, Entertainment Weekly, Billboard, H2O (Hip-Hop on Demand), CNet.com and Automobile Magazine. The Guru Guide will be available on the roughly 1.5 million TiVo units owned by direct subscribers to TiVo service. It won't be available to the 2.9 million who get TiVo via DirecTV. Pre-selected gurus are really nice, but eventually this feature needs to include your friend who has great taste in foreign films, or a colleague at work who never misses a classic sitcom rerun -- basically, anyone who wants to be a guru. Isn't that the lesson we learned from blogging? - According to the Wall Street Journal, Pioneer Electronics won't release its Blu-ray high-definition DVD player until later this year; they'd originally hoped to have it on the market this month. But Blu-ray players from Sony and Samsung are still expected to hit shelves this month. Movielink...is now offering new releases every Tuesday for only $15.99 - the same day they are available on DVD - one of the lowest prices available online or at retail stores. Log on today and download new releases like `Firewall' or `Underworld: Evolution.' Movie lovers will never need to leave home to get their favorite films again. In addition, Movielink offers hundreds of studio titles from a wide variety of genres, such as `Breakfast at Tiffany's' and `As Good As It Gets,' priced as low as $9.99. So whether at the beach, on a road trip, or just relaxing at home, movie lovers can download their favorite films and enjoy them anytime and anywhere. The lower prices make it easier than ever to build a convenient, digital film library, from a legitimate source. - Last week, Bud Mayo was showing off AccessIT's digital cinema set-up at the multiplex the company owns in Brooklyn, the Pavilion Theatre. Annlee Ellingson of Boxoffice Magazine was there. Mayo says his company is installing digital cinema equipment at the rate of 100 screens per month -- and that they expect to be doing 200 per month by the end of the year. Anders Bylund of Ars Technica has done a fine job evaluating the numerous video rental options available to consumers. He looks at Netflix; Blockbuster, online and off (a Blockbuster spokesman says the average store carries 7,000 titles, compared to Netflix' 60,000); a local mom-and-pop rental store; Vongo (over 1000 titles); cable video on demand; and, briefly, Disney's Moviebeam service. Here's a video clip from the Wall Street Journal's D Conference (held last week in Carlsbad, California), which I think is accessible even if you're not a WSJ.com subscriber. Bruce Orwall of the WSJ interviews director and cinematographer Barry Sonnenfeld. In a bid to preserve shelf space and fight slowing DVD sales, major retailers including Wal-Mart Stores Inc. (NYSE:WMT - news) have held talks with Hollywood's studios to develop kiosks where consumers can copy movies and TV shows onto DVDs and devices, industry executives said. Installing video-burning kiosks in retail stores would help counter the slowing growth in the $24 billion home DVD market, executives said. Yes, the DVD is a convenient format... but you also have to wonder whether these kiosks might also be capable of downloading a file directly to a video iPod or other portable media player. Which would you rather do? DVDs vs. Digital Downloads...Variable Pricing for Movie Tix? - Home Media Retailing this week held its fifth annual Home Entertainment Summit, the subtitle of which was `DVD's Nine Lives.' Here's the Hollywood Reporter's coverage. Apparently, execs on a panel that covered digital downloading "agreed [that] digital downloading won't have much of an impact on packaged media for at least a decade." ...With movie theaters taking ever more heat from home-theater systems and DVDs and cable channels like HBO, why not introduce a sliding scale that makes ticket prices more attractive for films that aren't exactly the next "Lord of the Rings"? Kendrick Macdowell, general counsel for the National Association of Theater Owners, responded that "this is a question getting bandied about more and more these days." In other words, theater owners themselves are increasingly aware that the movies they show are often unworthy of the hefty ticket prices they charge. And they know they have to do something to address the problem. However, Macdowell said it's unclear how theater owners could introduce a sliding scale for ticket prices without the cooperation of movie studios, which can lay claim to as much as 90 percent of box office revenue from heavyweights like "X-Men," which raked in about $123 million last weekend. "A lot of our flexibility on pricing is limited by the studios," he said. The speaker's roster is shaping up nicely for the LA Film Festival's tech day, "The Revolution Will Be Digitized: Technology and Its Impact on Film." (One of my favorite subjects.) Passes are $70 for a half-day, $100 for the full day. It's being held in Westwood Village, home to UCLA, on June 23rd. Speakers include YouTube founder Chad Hurley, Clickstar CEO James Ackerman, Peter Broderick of Paradigm Consulting, BlipTV.com president Paula Montondo, Movielink CEO Jim Ramo, and directors Jason Reitman, Brian Terwilliger and Brad Silberling. I'll be moderating one of the opening panels in the morning -- so if you decide to go, say hello. So who, exactly, is a good candidate for MovieBeam? According to the company's research, movie fans in 30 million American households make at least four round trips to the video store each month. If you're among them, you're an excellent MovieBeam prospect. You should also consider MovieBeam if you're paying for several cable movie channels but watching only a few movies a month on them. You could cancel the channels, saving about $10 a channel per month. The beauty of MovieBeam is that you pay only when you actually watch a movie. If your life hits a busy patch, you don't keep forking over money for a service you're not using.